I love the idea of a yard sale. Love it. I remember going on lots of trips with my ex-half-sister-in-law when I was a eight years old or so. We would go from one to the next, then head to the thrift store. So much fun for an eight year old with fifteen bucks! But now, I prefer thrift stores, craigslist and ebay for my second-hand finds and don't pay much regard to yard sales. It's a lot of work, after all, to drive somewhere an discover they only have used tupperware and wig. But guys - I hit the jackpot last weekend. I saw the yard sale sign day before, on the way home from work. It was less than 1/2-mile from our home so I made a mental note. I stopped by on Saturday, en route to do some thrifting (it's amazing how history repeats itself) and I'm telling you... this was like hippy-chic madness. The kind of garb I'm not cool enough to buy (Okay, Okay. I'm really, really cool. But I don't have space for rusty lunch boxes and vintage photos of someone's great-aunt who you never knew). There was one piece that I adored, and walked away from twice. It was so cool. But creepy. But way more cool than creepy. I felt sure it was way more than I wanted to spend. Finally asked about it. Apparently it was constructed by the home owner from a cow's pelvis (found at a salvage yard/antique store in South Dakota), salvaged wood, and coils from an 1800's chair. It was 30 bucks, yo. I didn't try to haggle. I just stammered and handed over the dollar bills, trembling like they would change their mind. If you were a fly on the wall, you would have heard some interesting things in the last week or so: "Would you hold my pelvis against the wall? A little higher! That's it...", "Please pick up the pelvis! I need it now!" 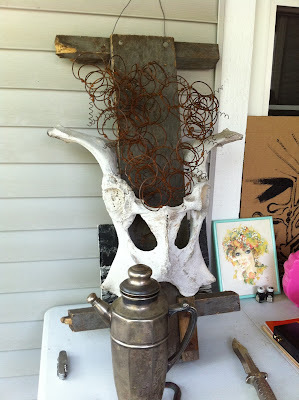 (I had to ask the hubs several times for to retrieve it from the trunk), and "Baby, I love my pelvis." Not sure it will stay here, but it's in the dining room for now. Here's a peek until I reveal the rug and the curtains. Your turn! What's your favorite yard sale find? Or do ya think they take too much work to get a good deal? 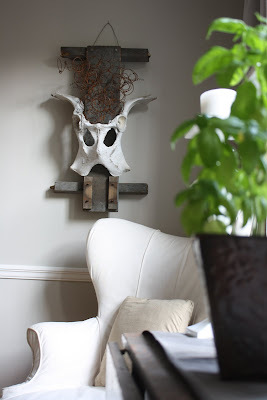 Update: I'm linking up to Southern Hospitality Blog. Hi, Erin, thanks for stopping by. I keep seeing you on Twitter, so I had to come over & check it out. WOW, that has to be the funniest yardsale find EVER! I think this one is going in my roundup page from this week's party. Did you link up? I did now! Linked up! Thanks so much, Rhoda! Well, thank you, I never knew what a cow's pelvis looked like and now I do. 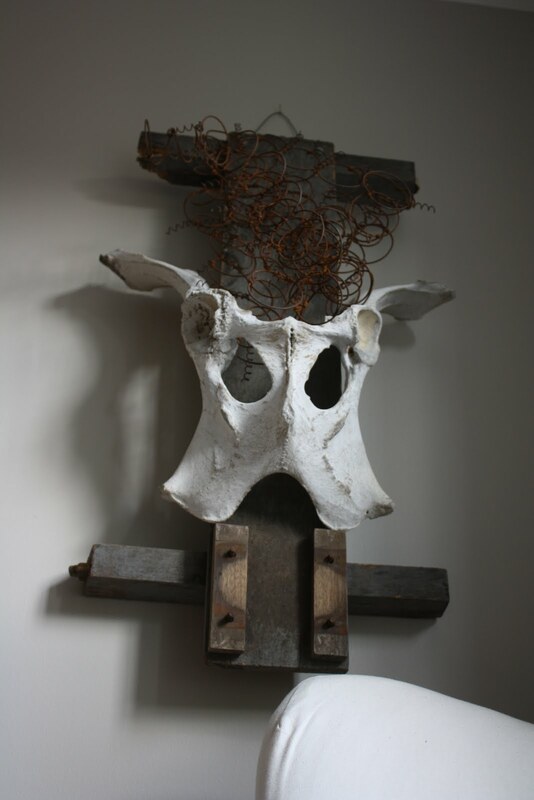 I once was taking a walk near my home and found a deer skull and hung it in my laundry room...my children thought it was weird and I KNOW my ex thought it was too, but, to each its own and I know you understand.